As you are entering Red Lodge there is a one and a half story, red Victorian house with white trim and a wrap-around porch on the corner of 7th Street and Broadway Avenue. The contrast of the red and white gives the house an inviting presence just on the edge of the historic district. Not only does the Red House have an exterior appeal, the interior is what makes it a special place. For years, it has been a ‘home’ for many artists who have come to work on their studio practice at the Red Lodge Clay Center. With a newly renovated interior, the home has five bedrooms with the capacity to have up to ten guests at a time. As with any home, the kitchen is always a place to gather and have conversation. Whether discussing what happened at the studio earlier in the day or learning about a new roommate’s past, the kitchen seems to always enable good conversation. This also applies to the dinnerware that sits in the cabinets, patiently waiting to be used. 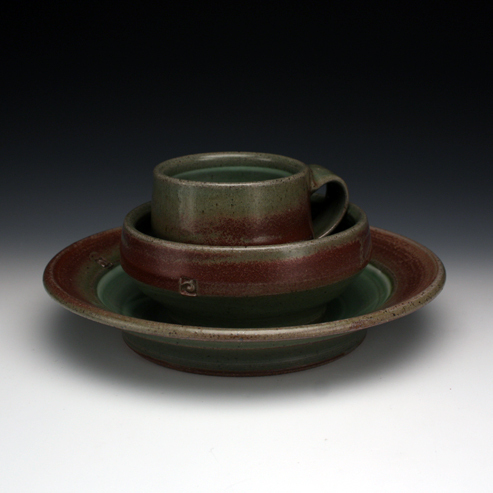 For most ceramic artists, the cabinets become a small gallery filled with mugs, bowls, and plates that activate the eyes with a range of aesthetics. For this exhibition, we have invited ten of our former short-term residents to create a place setting consisting of a dinner plate, bowl, and drinking vessel, made specifically for the permanent collection of the Red House. The ten invited artists will also showcase their new functional artworks centered around the theme of the place setting. The Red Lodge Clay Center could not be more excited to celebrate this part of our history with the community and share the importance of art in our every day lives.